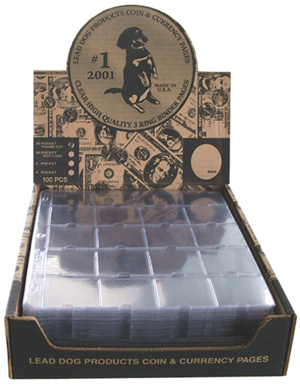 The Lead Dog 2x2 pocket pages fit in a three-ring binder and holds 20 coins in clear windows making your coin visible from both sides. Lead Dog notebook pages are made up of 8mil soft vinyl and provides outstanding durability, both at the seams and binder holes. Use with 2x2 cardboard flips. Pocket pages are used in conjunction with 2x2 flips and allow your to build a customized notebook for your own collection. - Put your coins in flips and staple together. - Insert your flips into the pocket pages in the order that makes sense to you. - Insert your pages into 3-ring notebooks for storage.